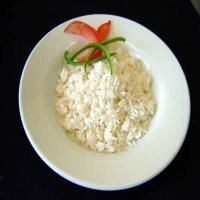 We are afraid this restaurant is currently closed! 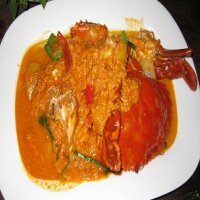 Stir fried crab, tiger prawns or scallops uniquely prepared with yellow curry powder, onions, spring onions, celery and bell peppers. 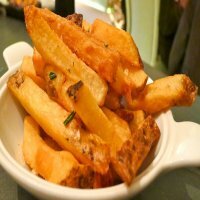 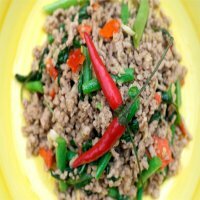 Low heat but big flavor! 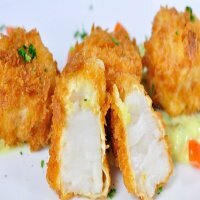 Cod loin deliciously prepared with yellow curry powder, onion, spring onions, celery & bell peppers. 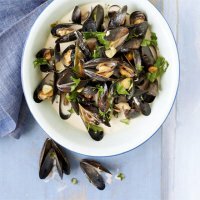 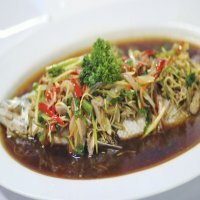 A fish lovers delight. 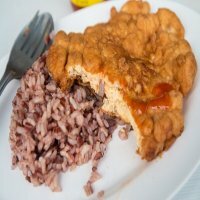 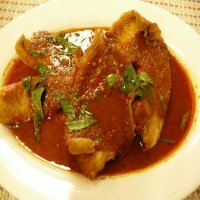 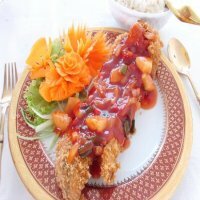 Deep fried fish (cod loin) dressed in a three flavors sauce with spices and fresh vegetables. 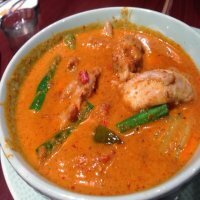 A rich Fillet of salmon wok fried and topped with a fragrant & creamy curry sauce. 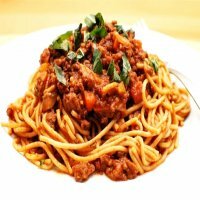 Spaghetti stir fried with beef, herbs & spices, mangetout, baby corn, onions, chilies, bell peppers, dwarf beans & carrots. 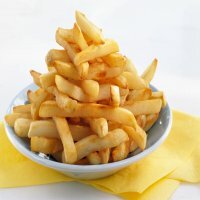 1402. 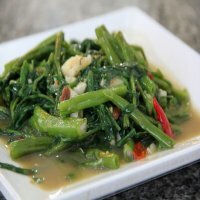 Raad Nah Koong-New Variation! 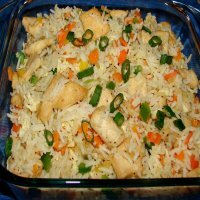 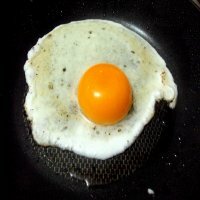 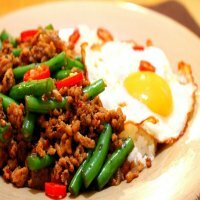 Your choice of fragrant chicken or pork fried rice with egg, mixed chopped vegetables. 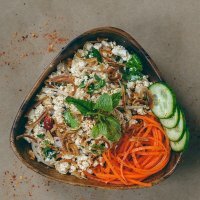 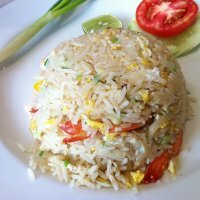 Fragrant crab fried rice with egg, mixed chopped vegetables. 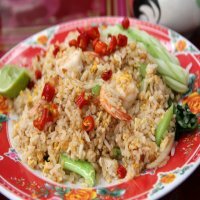 Spicy tiger prawn fried rice with basil, mushroom, chillis & bell peppers. 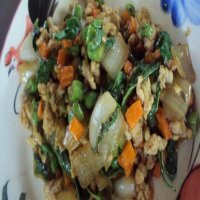 Spicy minced pork fried rice with basil, mushroom, chilies & bell peppers. 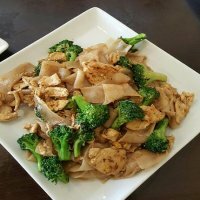 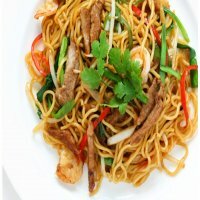 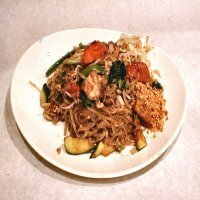 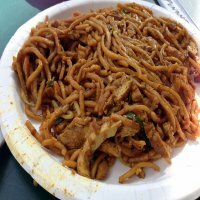 Stir fried rice ribbon noodles with your choice of chicken or park with egg & mixed vegetables of the day. 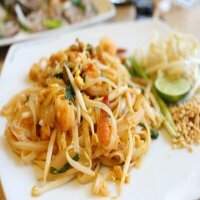 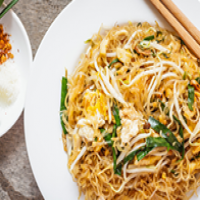 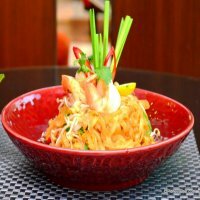 Famous thai noodle dish featuring narrow stir fried rice noodles with tiger prawns, egg, phad, thai sauce bean sprouts,dwarf beans & spring onions. 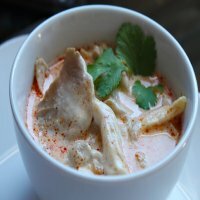 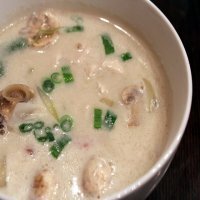 Luxurious creamy coconut soup with tofu, coconut milk, lemongrass, mushrooms, tomatoes, galangal, onions and various herbs. 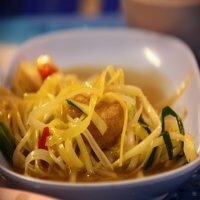 Mild clear soup with tofu, glass noodles, onions and coriander. 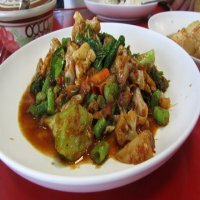 Stir fried tofu on a fragrant bed of spring onions, limejuice, carrots, cucumber, tomato, fresh chillis, herbs & spices. 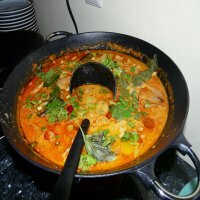 Tofu served in a velvety green curry made with dwarf beans, chillis, carrot slivers, potatoes & baby corn. 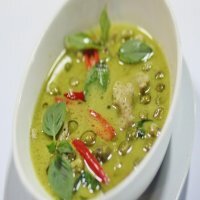 Tofu served in “Jungle Curry”. 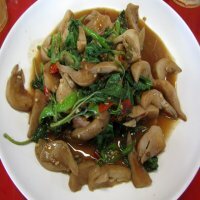 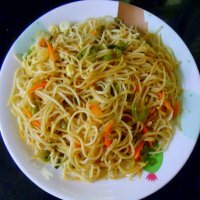 This extremely spicy dish does not contain coconut milk and is prepared with fresh herbs & spices, bamboo shoots, mushrooms dwarf beans & chillis. 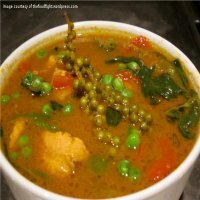 Milder version prepared on request!! 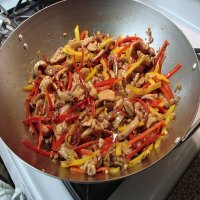 Stir fried tofu with sweet basil, garlic, bell peppers, dwarf beans, onions and chilies . 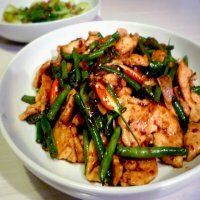 Spicy Stir fried tofu with onions, tomatoes, spring onions, diced carrots, dwarf beans and fresh chilies. 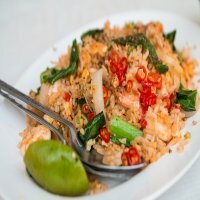 Spicy tofu fried rice with basil, mushroom, chillis and bell peppers. 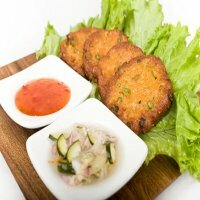 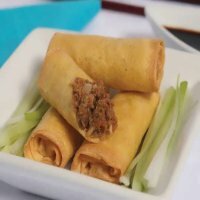 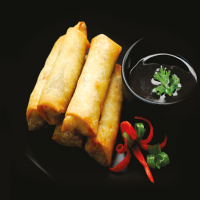 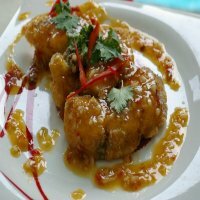 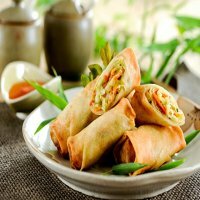 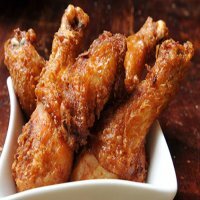 Egg coated fried mussels in batter with spring onions and bean sprouts served with both spicy & sweet chilies sauces. 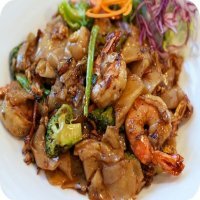 1411. 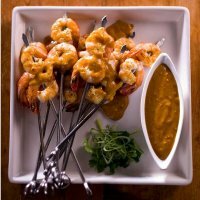 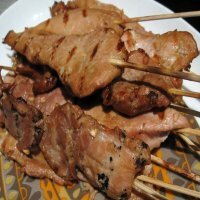 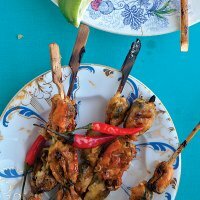 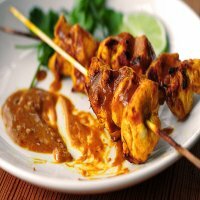 Tiger Prawn Satay - - NEW! 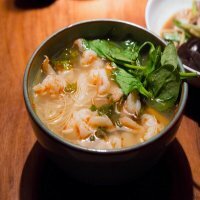 Renowned hot & sour spicy tiger prawn soup. 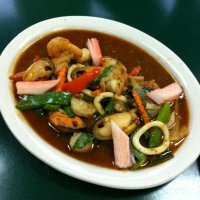 Renowned hot & sour mixed seafood soup with tiger prawns, squid, fish & mussels. 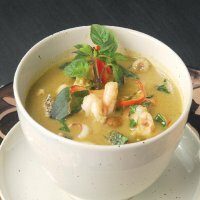 Luxurious creamy coconut soup with tiger prawns, herbs, vegetables & spices. 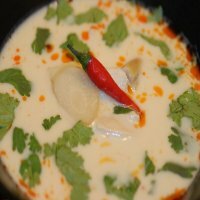 Luxurious creamy coconut soup with chicken, herbs, vegetables & spices. 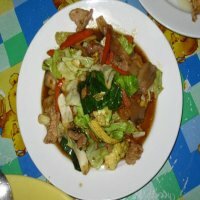 Beef on a fragrant bed of spring onions, diced carrots, cucumber, imejuice, tomato, fresh chillis, herbs & spices. 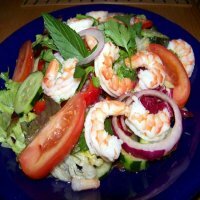 Tiger Prawns on a fragrant bed of fresh vegetables, limejuice, fresh chillis, herbs & spices. 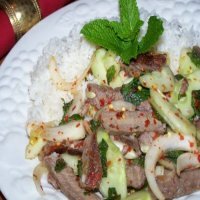 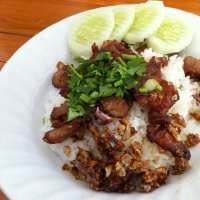 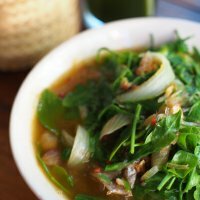 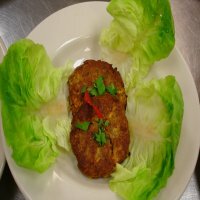 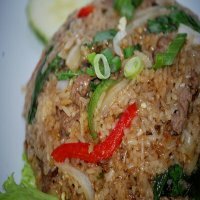 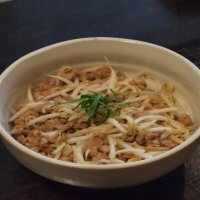 Your choice of minced chicken or pork dressed with limejuice, shallots, mint, coriander, lemongrass, roasted ground rice & fresh vegetables. 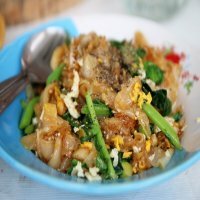 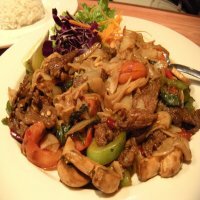 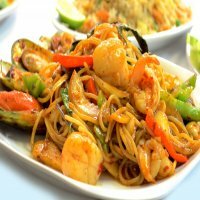 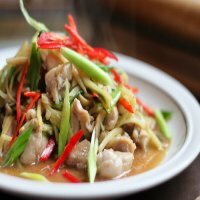 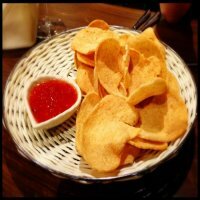 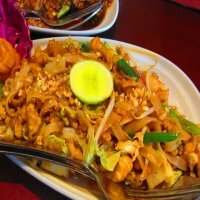 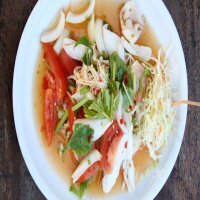 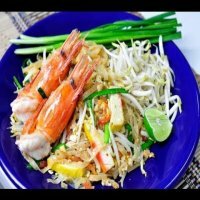 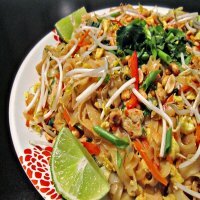 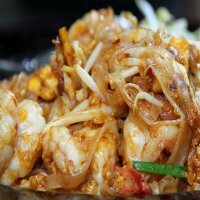 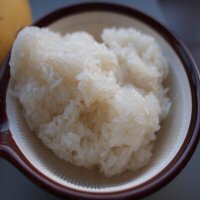 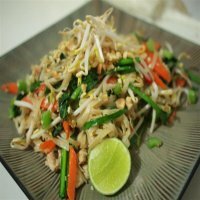 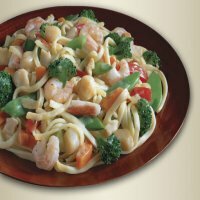 1404 - Yam Talay (Seafood Salad) - - NEW! 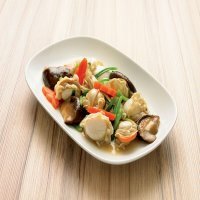 Deep fried tiger prawns, squid, mussels & fresh hake with lemon grass, chinese leaf and mixed herbs accompanied by a hot & sour dressing. 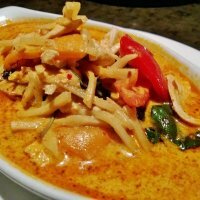 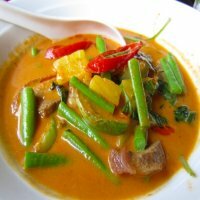 ger prawns served in a red curry lovingly made with coconut milk, bamboo shoots, fresh herbs, spices and fresh vegetables. 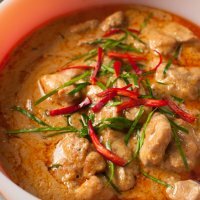 Your choice of chicken or beef or pork served in a red curry lovingly made with coconut milk, bamboo shoots fresh herbs, spices & fresh vegetables. 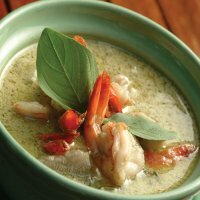 Tiger Prawns served in a velvety green curry made with coconut milk, bamboo shoots, fresh herbs & veg. 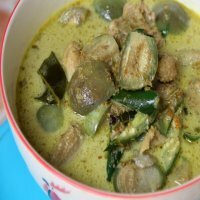 Your choice of chicken or beef or pork served in a velvety green curry made with coconut milk, bamboo shoots, fresh herbs & vegetables. 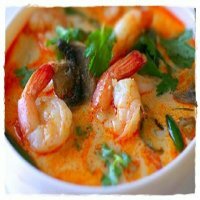 Tiger Prawns served in a creamy yellow curry prepared with spices, coconut milk, fresh herbs & vegetables. 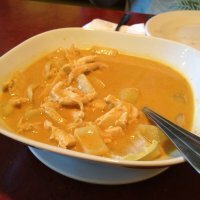 Your choice of chicken or beef or pork served in a creamy yellow curry prepared with coconut milk, fresh herbs & spices, bell peppers, potatoes, carrots & onions. 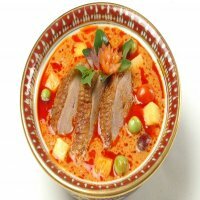 ger prawns served in a more traditional curry prepared with coconut milk & a variety of vegetables to produce a creamy yellow dish with an ncreased depth of flavour . 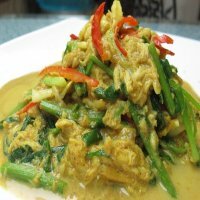 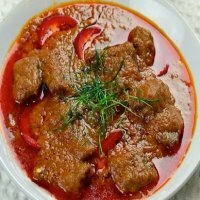 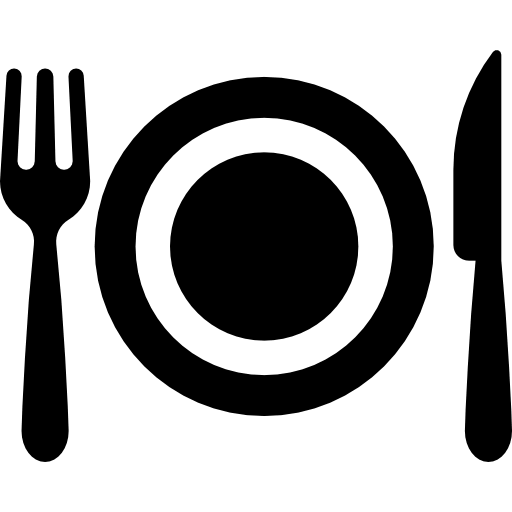 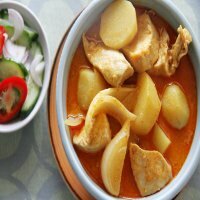 Your choice of chicken or beef or pork served in a more traditional curry prepared with coconut milk & a variety of vegetables to produce a creamy yellow dish with an increased depth of flavour. 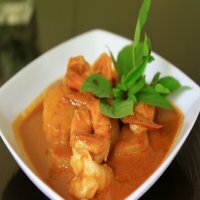 Tiger prawns served in “Jungle Curry”. 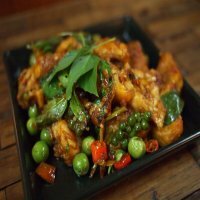 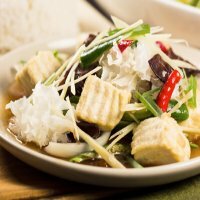 This extremely spicy dish does not contain coconut milk and is prepared with fresh herbs & spices, bamboo shoots, mushrooms, dwarf beans & chillis. 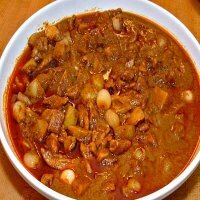 Milder version prepared on request!! 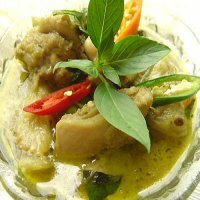 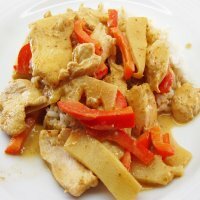 Your choice of chicken or beef or pork served in “Jungle Curry”. 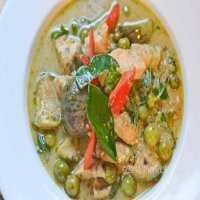 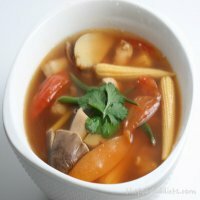 This extremely spicy dish does not contain coconut milk and is prepared with fresh herbs & spices bamboo shoots, mushrooms, dwarf beans & chillis. 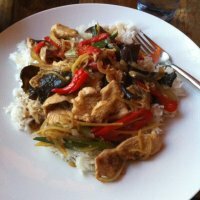 Milder version prepared on request!! 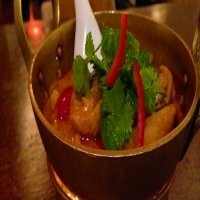 Tiger prawns stir fried in a spicy red curry sauce prepared with coconut milk, herbs & spices, kaffir lime leaves & dwarf beans. 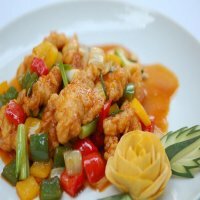 Prawns with chillis & fresh vegetables. 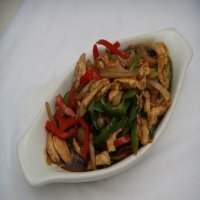 Chicken with chillis & fresh vegetables. 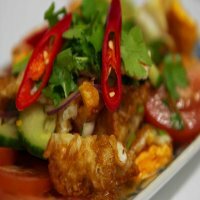 Fresh hake in roasted chilli oil and fresh vegetables. 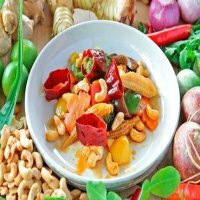 Tiger prawns in roasted chilli oil and fresh veg. 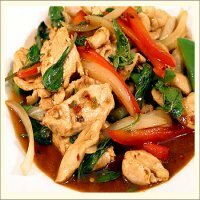 Your choice of chicken or pork in roasted chilli oil and fresh vegetables. 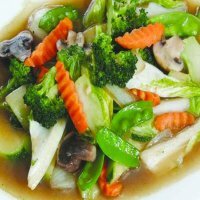 Tiger prawns in oyster sauce with vegetables. 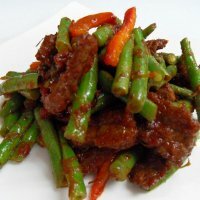 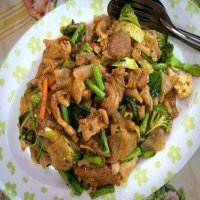 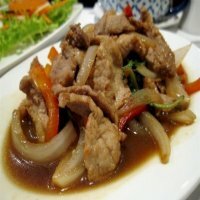 Your choice of chicken or beef or pork in oyster sauce with fresh vegetables. 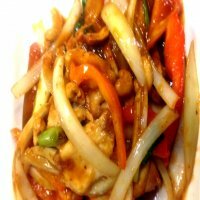 Fresh hake in sweet & sour sauce with fresh vegetables. 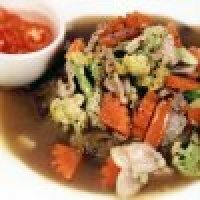 Stir fried fresh hake with ginger & fresh vegetables. 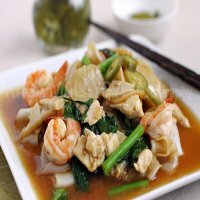 Tiger prawns with ginger & fresh vegetables. 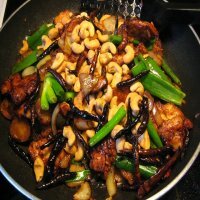 Tiger prawns with sweet basil, garlic, bell peppers, dwarf beans, mangetout, baby corn, onions & chilies. 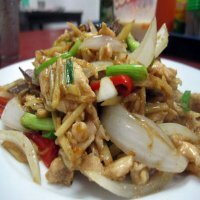 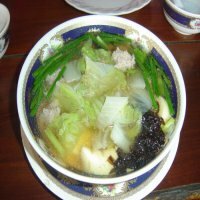 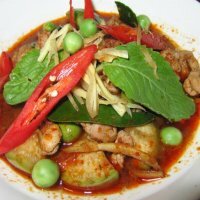 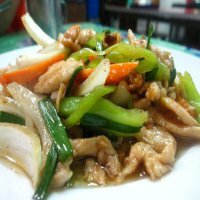 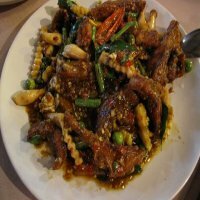 Your choice of chicken or minced pork with sweet basil, chilies, garlic and a variety of fresh vegetables. 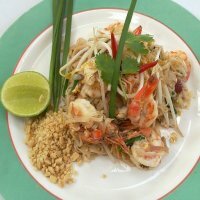 Tiger prawns in very spicy South Thai style chilli with bamboo shoots, dwarf beans & chillis.